I grew up in Buffalo, NY. I moved to Edmonton, Alberta in January 1977 to work with a university student ministry. The summer of that same year, I met Mike Woodard. We worked side by side for three years until I moved to Ontario. In 1983, I moved to Québec to head up the French student ministry. In 1989, I wound up in Canada’s capital, where once again I was able to work side by side with Mike in student ministry. I married Anne-Marie in 1986 and am the proud father of three adult daughters. Since 1999, I have worked with the Christian Embassy, which serves members of Parliament, senators, diplomats and business leaders by providing an informal networking service and by helping those with spiritual questions investigate and cultivate a relationship with God through Jesus. I started running while in high school. I enjoyed participating in 10K races until I developed a chronic hip injury in 1995 which is when I switched to cycling. Since then I have cycled over 137,000 km. I have done cycle-tourism in central British Columbia, the Maritimes (NB, PEI, NS), the Gaspé Peninsula and other regions of Québec and Ontario. Riding across Canada has been a dream of mine for several decades. While living my dream in 2014 with the cycling4water team, my dream was suddenly cut short through a nasty accident. Now in partnership with Timo and Alain, I hope to “continue the dream” while continuing to raise funds for GAiN‘s “Water for Life” initiative. Why “water for life”? In 1981 I travelled to the Democratic Republic of the Congo. I spent 5 weeks in Goma working with churches. While there, I had a chance to live in one of the rural villages for about a week. Seeing the women go off to fetch water early in the morning, carrying the containers on their heads, so that they would be able to provide food and drink for their families for the next 24 hours, helped me appreciate how blessed we really are to have clean, safe water delivered directly to our homes. It is a very sobering thought that close to 1 billion people do not have this privilege! Though the task looms so large we cannot sit by and simply do nothing. Help us in raising funds for clean water for 60 African communities. Timo (far left) was born in Finland. In 1956, at the age of five, he moved with his parents, two brothers, and one sister to Northern Ontario. Six years later the family moved to British Columbia, which he now calls home. At the age of 19, he returned to visit the land of his birth, attended a Bible College, and met Marjatta, who later came to visit Timo in Canada. She stayed, they got married, and now they have four grown up children, and five grandsons! Timo had been a commercial fisherman in the past, and in the winter months, continued his education, eventually selling his fishing boat, and going to work for the Canadian Coast Guard for seven years. In 1981 he went back to college, and became involved in youth ministry at Finnish Bethel Church in Vancouver. He later continued his studies at Fraser Valley College, and Simon Fraser University. He is presently a high school teacher in Mission B.C. Often seeing long distance cyclists pedaling along the highway near his home, Timo thought that he would like to do just that, pack up some gear, and ride away. Over the last decade, sometimes with Marjatta, or with other friends, he has pedaled various routes in British Columbia. One summer, Marjatta and Timo packed up their bikes for a four week adventure in Finland. They did a most memorable 500 km loop above the Arctic Circle, sometimes sharing the road with reindeer! Every fall for the last ten or so years, Timo, along with friends, John and Daryl, goes on a two day, 200 km fundraiser ride for the B.C. Lung Association. But to ride across Canada this summer, what a challenge! I want to start by saying that I am not a cyclist. I have been married to Georgine for about 33 years and we live in Gatineau, Quebec. We have two sons, one of whom is married. The other one has just started working in his field. I met Rob Montgomery a long time ago when we were both in the student ministry. I heard about the adventure that he and the rest of the Cycling4Water team did in 2014. 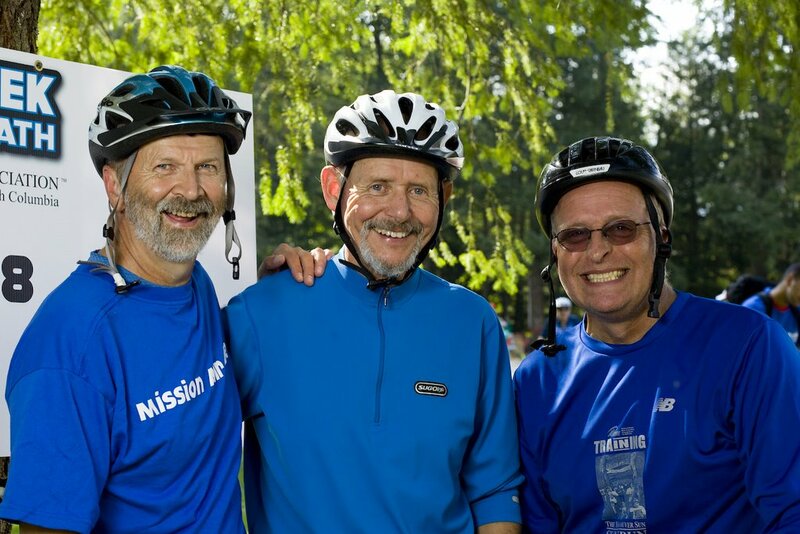 During a Men’s conference one morning, Rob shared with me his desire to continue with Cycling4Water for another summer and that he needed a person to assist with logistics. I told Rob that I was retiring this summer and that I would be free to join his team. I feel excited and am looking forward to this adventure. Gentlemen, start your engines. Can we say that to a cyclist? Mike is a small town boy who grew up on a hobby farm in Michigan. After finishing a science degree at Central Michigan University in 1977, Mike moved to Canada to begin working in university student ministry. He married Karen in 1978, after years of friendship that started in high school. Edmonton was their home for 11 years. Their son and 3 daughters were born in rapid order. Home base moved to Ottawa and then to their current home in Abbotsford, British Columbia. His work with students has taken him to over 30 countries. While continuing to work in the student world, Mike and Karen both finished MA degrees from Trinity Western University, ACTS Seminary. Mike and Karen currently work with FamilyLife Canada. Their family has expanded to include 3 sons-in-law and two grandsons. Mike enjoys backpacking in the stunning mountains and wilderness of Western Canada. A thrill seeker at heart, bungee-jumping, sky-diving, marathon and triathlon have been checked off his life’s “to do” list. His motto is, “Life is an adventure!” In the summer of 2012 Mike’s first book was released. Love That Lasts-52 Insights for Couples is a collection of insights that first appeared as weekly posts on the FamilyLife Canada website. The book is now available in English and French. This journey across Canada is a way to celebrate 60 years of life and give a gift to those in profound need. Mike will never forget the first time he walked through a slum in Mexico. He wept over what he saw. This ride is a way to do more than weep for those in need. Richard and I are not cyclists! We are mountaineers and avid outdoor enthusiasts. I have known Mike for many years and during this time we have learned that we share a similar sense of adventure. When Mike told us about his plans for his 60th birthday, to cycle across the country to raise money for clean water, we weren’t completely surprised. Since Richard and I are both secondary school teachers, with time to spare in the summer, Mike asked if we would be interested in coming along as the support vehicle for him and Rob. Always up for an adventure ourselves, we agreed to come along. Of course, we quickly decided that we would like to do some cycling as well. Richard really wants to cycle the full 8,000kms…and I love making green protein smoothies…so it looks like he’s on the bike, I’m driving the RV and looking after the crew. The logistics of this adventure is daunting, but extremely exciting. We already regularly do painful activities for fun, so we are up for the challenge. Let the training begin!